Tee shirts with the con logo on them are a popular merchandise item, for attendees and non-attendees alike. Con chairs in recent years have offered con tees in several colors, which has increased sales. In recent years con chairs have used a Texas company known to fandom or have had fans with the appropriate machinery make the tee shirts. Ask a con chair or two what they did and decide how you’d like to do it. Generally you will be charged a set-up fee for creating the template for the tee, and usually there is a minimum order for tee shirts. Due to cost, in recent years con chairs have taken pre-orders to reduce the number of unsold tees, and have had only a small number of extras available for sale at the con. It has not been useful to take orders at the con for post-con delivery, as if you must have a minimum order, it may be difficult to achieve that number since most fans who wanted a tee will already have pre-ordered one. If you decide to order a few extra tees to sell at the convention, consider the most popular colors/sizes already ordered by fans as a good guide to what might sell. When you set your ordering deadline for tees, make sure you’ve built in more than enough time for the tee shirt order to be filled and for you to organize the order when it’s delivered. [See the Con History pages for samples of previous cons’ order forms.] A good rule of thumb is to set the deadline six weeks prior to the convention. That not only allows enough time for the order to be filled, but for any mistakes in the order to be addressed. And be sure you remind fans for at least a month beforehand of the upcoming deadline! When your tee shirt order arrives, check them all against your master list to ensure you’ve received the right number of each size and each color ordered, and double-check that against the order forms sent in. Also, check over the tees to ensure the printing looks good. When you are satisfied that your order is correct, it’s very helpful to invest in a box of Ziplocs! Fold each tee into a Ziploc, seal it, put the buyer’s name on the Ziploc, then pop the tees in a box in alphabetical order. This box can come out at registration time at the con, all ready for the tees to be distributed in an orderly fashion. Generally, con tees ordered by non-attendees are mailed out immediately post-con. Several things are traditional to put in the tote bag: a con schedule, the conzine (if you have one), little giveaways (like pencils imprinted with the con name), some flyers about the city the con is being held in, etc. In recent years, con chairs have asked fellow fans to donate items for the totes (often these will be tissue packets, candy, or other small items); if you do this, ensure you know what each volunteer will send or bring, so you don’t end up with three people bringing tissue packets! 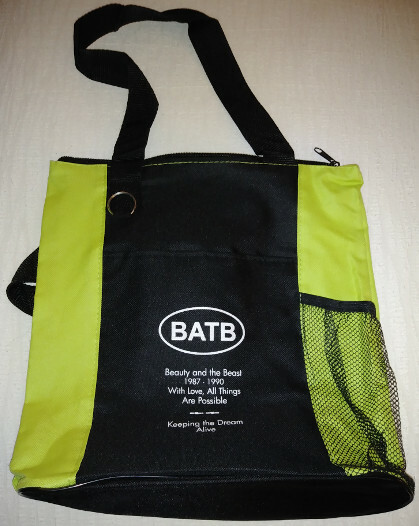 Tote bags generally are given out as part of the cost of registration. 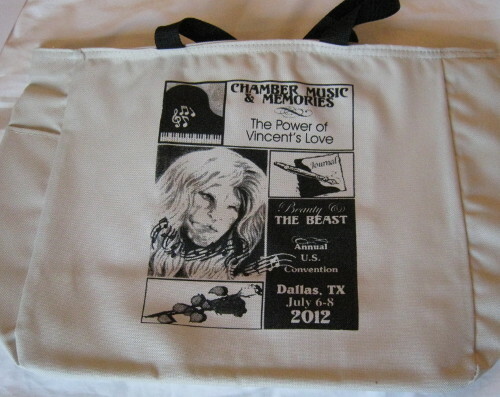 Generally you can get your tote bag made where you get your tee shirts made. Don’t forget to have a few extras made up for non-attendees who’ll want to buy a full con tote, but don’t go overboard – extra totes tend not to sell well years down the road. Stuffing the tote bags has become something of a group activity, and it’s a fun way to ease into the convention for many fans. If you can (and it will save YOU loads of time), bring all the items for the totes to the con, set them up on a long table, and let volunteers move around the table stuffing individual tote bags (but leave the conzines in their boxes to pass out separately, as they add too much weight to the totes). Let the “stuffing” volunteers take their own totes when they’re done, and give them out to any other fans who happen by. If you also have the registration packets containing individuals’ name tags available, those can begin to be passed out informally, as well. Filled tote bags are bulky and take up a LOT of space, so try to fill them as close to where they will be handed out as possible. You may decide to offer other types of con merchandise. Keep in mind that what used to be a huge seller in the past (mugs) is not such a good seller these days. Generally conzines and full con tote bags are good sellers to non-attendees, and sometimes other items are developed for sale for both attendees and non-attendees, such as sleepshirts and pillowcases, and since these last two items don’t have to be con-specific, they can go nicely from con to con with no reduction in price, if need be. As with con tees, merchandise ordered by non-attendees should be mailed out immediately post-con.